Disney has done several live-action remakes of classic films. Up to now, I've considered all of them to be good to great. 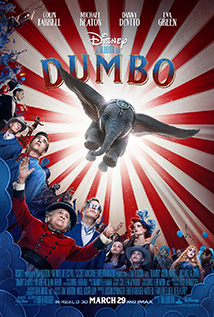 Now, the little, flying elephant is hitting the big screen in all of his big-eyed, big-eared, CGI glory. Every streak has to come to an end at some point. I wish I could say this movie is fun and exciting and amazing for kids of all ages, but I can't. The reality is that it is really long, slow, and boring. The pacing is slow for most of the film, and it comes to a near stop in a few scenes. The story is told all wrong, the acting is well below average for a cast like this movie has, and the overall tone of the film is too dark. It is also ironic that the bad guy is essentially a Walt Disneyesq character that creates his version of Disneyland. I never thought I'd see the day where Disney turns themselves into the evil empire. Having said all of that, there were several people that applauded the movie as it ended, so your opinion may vary greatly from mine. You might find it beautiful and endearing. And, truly, I hope you do. But, for me, I have no desire to ever see this film again. If you are planning on seeing it with your family, you may want to see it first before taking the younger ones, or do some thorough research before taking them. It is a Tim Burton film, so it is already dark, but there are a couple of scenes that feel like a bit too much for a kids' movie. There isn't anything so mind-blowing in this movie that makes it worth seeing on the big screen. You'll get the same effect by waiting for the digital release.